have a lot of things to carry. It is completely the perfect size. is totally going to be a re-cap of my favorites. i love your lace top!!! and those shoes are amazing!! ive never seen anyone look so stylish for school! i love the bag, id use it all the time, it gorgeous and im always carrying loads around with me so it would be perfect. whoaaa i love your boots! that backpack is purrrfect for school! great find! fashion week was awesome! got so much inspiration! Lace is my very favorite trend right now. It looks great on you! I like how you added the bowler and shoes, it makes it a little more funky and less girly! i love your backpack! i ordered a leather one off ebay last year and it is probably my favorite accessory i own! I, too, know what it's like to have the perfect backpack. :D Yours is the most adorable thing! And I have similar shoes, but God knows I can't wear them on campus without feeling utterly ridiculous. I don't have the confidence yet, but seeing as I paid $50 for them, I better get it soon! Haha. Also, I love the lace. Indeed,the backpack is an amazing item.I didn't find the perfect one , that's why I keep changing then to match my outfit. you look really REALLY great! :) and the shoes are awesome . you've got a nice blog, hope you'll become a follower of myblog too? The backpack is really cool and it seems really versatile as well. And your shoes are so fierce and fabulous. I adore them. I've been looking for a backpack like that! It's so perfect and I love this whole look. I always need jeans inspiration haha. you look perfect! I want your lace sweater!! I love your top and backpack ! the boots and school bag are really awesome! Love the top ad the hat, though I wanted to see it on ur head!! 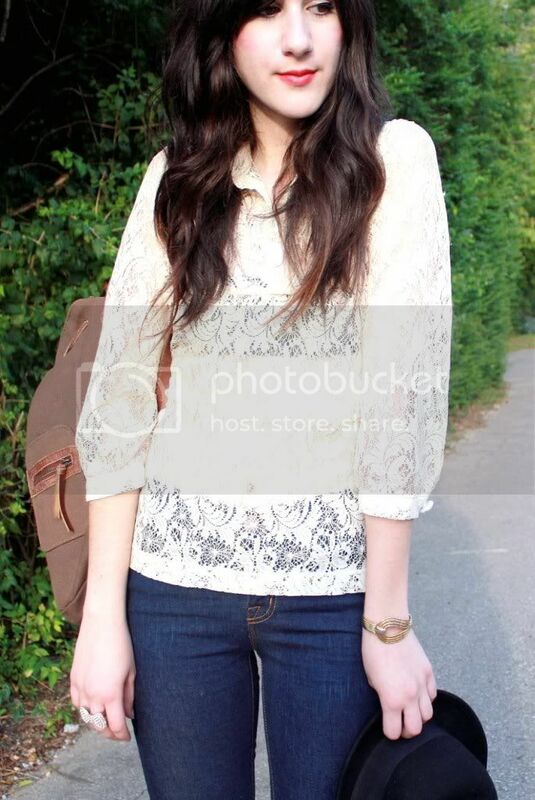 What a chic back to school outfit:) I love your backpack and that's such a pretty lace top! I'm still in search for a similar top:) Hope ure enjoying the weekend, Bonnie! PS: I posted a random of my summer nail polish! Hope u like it!! =) See u in my blog! Sweet backpack and I also love that top! that is one perfect back pack! perfect outfit - simple, but so feminine and chic! i am slighty obsessed with such backpacks too, regretting that i get rid of my old ones!!! Lovely! You look so pretty. I love the top. After I saw this post at first - I went on UO online and looked for the backpack....le sigh. If only I was still in school! But it'd make a great purse/carry all as well! You're so incredibly stylish for class. Where do you go to school? Is everyone so adorable and fashionable? If I saw you on campus, I'd run up and gush over those shoes! your hair! your hat! Love your outfit, which is no surprise because I love all of your outfits! Those shoes are awesome! the backpack is amazing! I love the colours. I have a liberty backpack... But i never use! You look is so cute, especially the top! Love laces too! I'm so happy that you like the post inspired on you! I love your style!! Hi lovely! Thanks for stopping by. 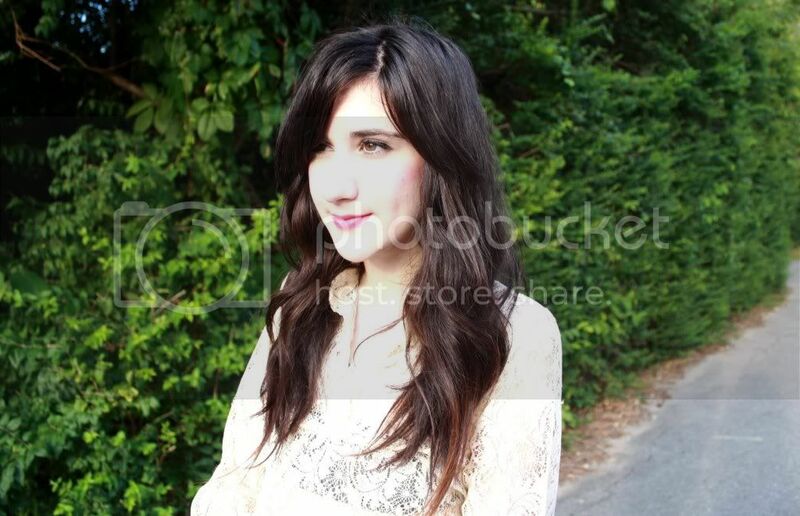 :) I just finished looking through your blog, I really liked it. I will follow you now! By the way very cute backpack. i love your style and you are SO GORGEOUS!! +++enter my giveaway to win A HOUSE OF HARLOW 1960 RING! Oh my gosh your backpack is fabulous fabulous fabulous! I totally love your style! This look is amazing as well as your looks on the previous posts. j'adore ton look, et ce top avec le jean et ces chaussures à talons compensés, c'est le look parfait. j'adore. I love your backpack ! I really have to find the perfect backpack before I go back to school. 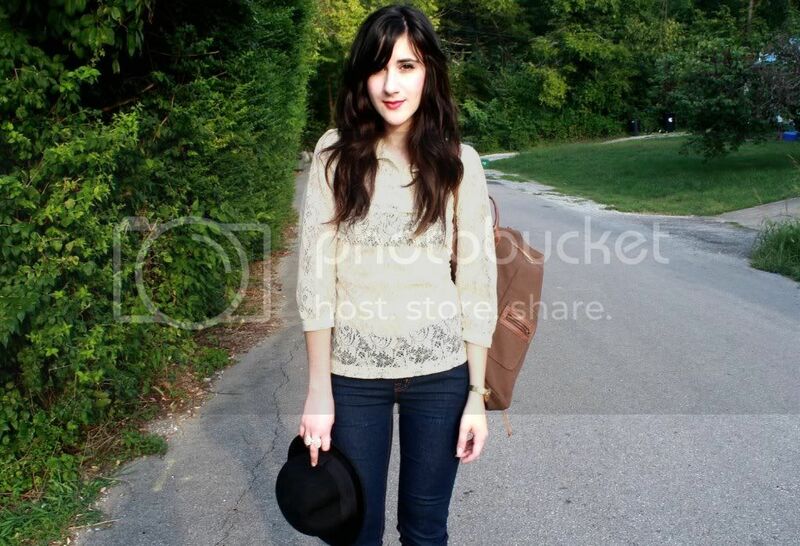 the hat, backpack, lace and wedges omfggggg <3 you got it all girlfriend. haha! Are you interested in following each others site? I love your blouse and your backpack is really lovely. If only I had looked this mature, sophisticated and chic my first day of college (I know this is your, what, 4th year? ), my college experience might've been much better than it was. Wow I love all of your looks! Very inspirational! the lace looks great, really pretty and soft . particularly drawn to those heels too . great blog, literally just found it . school outfit? wow, this would be my travel outfit hehe. i love this top SO MUCH! probably one of my favs from all the outfits you've posted. Great post... Thanks for visiting, come again! gorgeous look, really love your top!